Former House Speaker Newt Gingrich said in an interview with the AP in Des Moines, Iowa today that he's considering a run for President of the United States. Gingrich says that he's currently focused on the mid-term elections and that he'll make a decision on running for the Presidency by early next year. Gingrich is best known for leading the 1994 GOP takeover of the House of Representatives for the first time since 1954. Gingrich was the architect of the Contract With America which brought conservative values back into the mainstream despite opposition from liberal lobbying groups such as the Sierra Club. In the AP interview Gingrich said that President Obama would go down as one of the worst presidents of modern time. 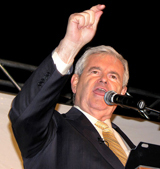 Will Newt Gingrich be the one to step up and become the leader that the GOP is currently lacking? Only time will tell but, one thing is for certain: the race starts now!